The 400year old frame is still there but the rest is new, It has no carpets just tile and oak. Only one and a bit bedrooms but a nice big conservatory. There's little modern in it but I prefer to live in the old fashioned way. You've done a marvellous job Heron...updated the cottage but kept it's original character...beautiful flowers out front too. Excellent work Heron - it looks lovely! Lovely to see the before and after pics where the work you have put in can really be appreciated. As for the other pics I love the dog and the roses. I love to see before and after photo's. This is superb ! 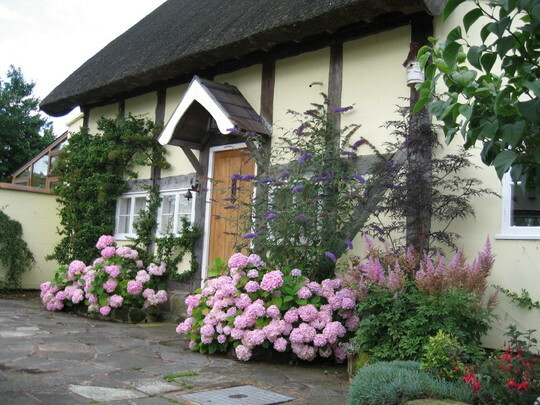 Marvellous transformation - what a beautiful cottage and gorgeous front garden bed. Excellent job! I thought the before was beautiful - but this is superb! Is that a thatched roof Heron? What a transformation Heron, it's beautiful love the front garden. Yes it is Skillen, a new one as in 2000 I lost the old one in a fire, I only have oil central heating now and no garden fires either. I was just finishing decorating after my retirement when a spark from the log burner ignited a starlings nest that popped out of the chimney and onto the thatch, by the time the firemen arrived it was well alight. passers by all stopped and helped me remove as much as possible from the cottage until the firemen arrived. We had to live in in a caravan in the field alongside for ten months. It was a very bad time and It took me a long time to get over it. The whole event was filmed by a BBC cameraman who arrived to ask permission to film old cottages he got more than he bargained for as he wasn't expecting to find it on fire. At the time I told him to B*****r off but later we became friends and he gave me a video of the fire, I've not watched it yet. After all your hard work and the heartache of the fire (been there, felt that) you deserve many long, happy years in your enchanting cottage - love it! That's awful - devastating for you heron. I don't think I would ever watch the video. But what a wonderful job you have done. It looks fabulous now. What a horrid time for you Heron...but it looks fabulous now...a real Phoenix. Thank you for your complements, it may look like a 'Chocolate Box' but I assure you there are no chocolates inside this box......I'm still on a diet, still two stone less. There is a chocolate diet you know - apparently you can lose weight eating chocolate, lots of pasta and popcorn!!! Sounds like my sort of diet. Is it a listed building? That is so beautiful! What a fantastic job you've done! Bernie, I want to go on that diet too! Beautiful cottage and garden Heron,well done ..can you see Mow Cop or Cloud End from your house? Just beautiful and a total credit it to you. What a transformation, but so in keeping with its' age, what a wonderful home now. You are very good at designing interest into your garden on many levels. What a lovely old cottage, such a lot of character, was sorry to read of the fire, glad all is back to normal now. your cottage is the sort, I used to search for, when visiting England.. I used to be 'lost' to my friend, who'd worried, that I would have been kidnapped or something else. I just knew, walking around their neighbourhood, would bring me views like your cottage. I made a 'goldcoast' trip one year with a friend of mine. They all went into an underground cavern to look at stalagites or some such thing. But I went instead around the area and litterally droooled over the fact that ONE Hydrangea plant could have 3 colours in it.. I was told that it had to do with the soil of Devon. But oh, me oh, My BEST of time, was just walking in neighbourhoods where all these sort of lovely and quaint cottages were plus all these gorgeous gardens. THAT to me, was England at its best. I read about the dreaded fire of your cottage and was horrified! I understand of the trauma of loosing ones most dearest posessions and all that one has gathered as memories in a lifetime. I will be back to your side to watch all of them lovely photographs and to read your blogs. thanks for posting here and sharing all that you enjoy with us. Little Ol' me, imported from the former Dutch East Indies, via the NLs to Canada.. (if this isn't space travelling, then I don't know what would connotate it! haha) Powderbrush or brush in Canada. OH! Lest best? Have THE best summer EVER!!! What an interesting person you are Powderbrush and such an interesting life. It sounds very nice and quiet where you are, far from the madding crowd and plenty of space. Thank you for your complimentary words regarding my Cottage. It is as idyllic as it looks. We're very happy here with our little dog and enjoy the quiet life just like you. What a beautiful cottage, such a warm welcome! Your cottage looks so beautiful Ron.........tragic to have burned but look, out of the ashes has risen this amazing place.........I'm so sorry reading your story it must have been horrendous. Well done for managing to cope. I'd completely forgotten about Nypro Janey, well it was a while ago. I've been reading up on it and from what you say about how near you were, you were very lucky. It's difficult to comprehend how structural damage was caused eight miles away in Scunthorpe. All that hard work,did you have to have a complete re-build? I can't believe its 36 years ago........where does all the time go? It was the vacuum after the explosion that damaged our properties...if the wind had been from the north we would have been flattened...as it was, lots of us were knocked out for a few minutes. Most of the casualties in the village were from flying glass...Ian and I were the first ones at the hospital with elderly neighbours who needed treatment.....I remember seeing my photo on the front of the local paper..the houses weren't re-built but restored and I remember we were thrilled to have central heating installed as we didn't have it before...Lol! Sorry to hear about the fire Heron, it must of been devastating. I know exactly how you feel. I was caught in a fire when I was little. To this day I am scared of fire, & hate it whenever I smell smoke or hear the fire alarm. You can move on, but it never leaves you. It's good what you've done, you've done a really tremendous job in restoring it. All my life I've considered myself fearless and well adjusted, but now 10 years on, like you I go into a tis when I see smoke. No more winter log fires, not even a garden fire. Yes they are Hydrangeas and as Powderbush says they vary in colour depending on the acidity of the soil. This cottage is really well done up Heron, I love the hydrangeas. Thanks Pip C, have to say that it's just perfect for the two of us Oh and Barnaby of cause. If you look in my photos you'll see him Pip, a cream/gold coloured Lhasa Apso. Perfect cottage heaven. You lucky and clever thing you! Thank you Pen, 'Lucky', a little; 'clever' sort of, but mostly it was just hard work, sacrifice and to quote you, "Passion"
and i can vouch for ur cottage and garden heron . STUNNING i think is the word . just spent all afternoon cleaning my log burner and gona get the sweep in asap after you telling us that story , no chances taken . hope u enjoyed ur viset to ours. we certainally did.